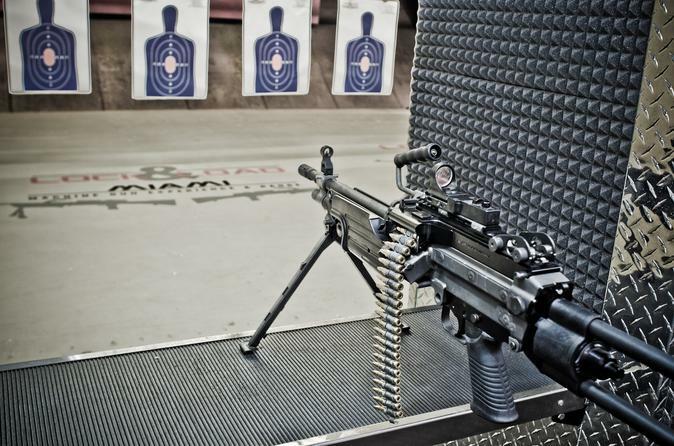 Shoot machine guns and feel the adrenaline rush in a safe and controlled environment. Miami's premier machine gun experience and range will get your adrenaline pumping with an extensive collection of exotic firearms that you can shoot under the supervision of trained professionals. Whether you're a first-time shooter, local or international tourist, rest assured that the friendly firearms specialists are here to guide you every step of the way. When you arrive, you will quickly see that this isn't a normal gun range. In the lobby there is artwork, replica firearms that you can handle, historical details of the guns, large TVs with firearm videos, plenty of areas for photos and a decommissioned helicopter hanging from the ceiling! After taking in the sights, you will check in with one of the Sales Associates who will provide you with a waiver form and make a copy of your ID. From there, a Firearms Specialist who is either former military or law enforcement, will take you through a training with replica guns to teach you proper shooting stance, prepare you for what to expect in the range and explain the safety rules. You will then put on eye and ear protection (provided) and enter the gun range. Your Firearms Specialist will be with you at all times and go through one gun at a time providing background details on each firearm. Others in your party can take photos and videos of the experience and then you will be able to take the target home with you to show off to your friends and family! It's an adrenaline rush that you'll never forget! There is a private, secure parking lot and the gun range is conveniently located in Miami's Wynwood district, walking distance from Midtown shopping areas and just a short drive from Miami Beach.